Cosmos Little Egypt is a village encompassing replicas of the country’s major tourist attractions, from Qaitbey Citadel in Alexandria, passing through Giza’s Pyramids and Sphinx, the Delta, Egypt’s waterways, the Red Sea mountains, and reaching the Luxor Temple in the south. It has educational facilities such as a panorama theatre and scientific labs. The village takes up 190 feddans, cost approximately EGP 290m and is located in 6th of October City on the Fayoum road. The project is implemented and managed by the armed forces, and sponsored by the Ministry of Education. It was first built in 2007 and completed in 2011, but was never officially opened after successive political events since the 25 January Revolution. The replicas are one-eighth the size of the real monuments. The exception is the globe, which holds up to 25 to 30 people. From the windows of the earth’s replica, one views a map of the earth engraved in the ground. From computers available inside, you could choose any place on the map and it would light up and emerge, with facts about the chosen area on screen. Only this feature is not working, and there only six computers. The water which was supposed to fill in place of oceans and sees was dried up. There is a four story surveillance tower to view the whole village from above, but the telescopes at the top were no available for use. Neither were the scientific labs or fishing facilities. Replicas of the temples in Upper Egypt were superb. The hieroglyphics were impressive. Temples include Hatshepsut, Philae, Edfu, and Karnak. The High Dam and Mohamed Ali Mosque in the Saladin Citadel replicas were admirable as well. The technology used in showing the panorama films was good, and included a five minute film about extraterrestrial life in outer space was shown. Then it was cut, and a sad song about an astronaut leaving home played, followed by a trailer of an animation movie. It costs EGP 1.5m to buy a full movie with the technology used in Panorama movie theatres, yet it would have been more cost effective and a better investment in the country for an innovative Egyptian youth to make the films played. 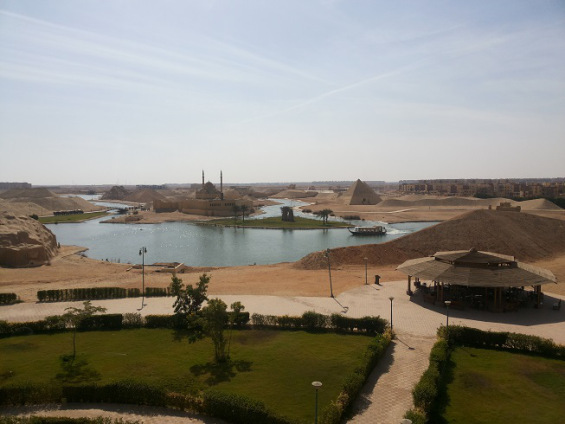 A tour could also be taken through the water way surrounded by the replicas and representing the Nile, the Red Sea and the Mediterranean Sea. However, taking this 15 minute tour would require half an hour wait on a crowded port. Two out of three ports are functioning, served by two boats. The most disastrous feature in this village was the caves displaying primitive life of the human race. Were cavemen actually red-eyes trolls? Not a trace of Coptic heritage could be found in the village. Neither were there any tour guides or many employees. The village management refused to lease a tour guide, and asked us to leave if we do not approve. Egyptians who cannot afford to travel around, or tourists who do not have enough time to visit all of Egypt’s main attractions, would find this place helpful. But going to Cosmos Little Egypt is nothing compared to the majestic feeling you get standing amid the genuine work of the Egyptian ancestors. Little Egypt, just like the real Egypt, has resourceful potentials that are sadly ill managed. It is a good initiative with bad implementation. Privatising the project, or hiring a foreign company to run it, will have a tremendous difference in making the place suitable for visits other than school field trips. A ticket costs $15 dollars for foreigners and EGP 50 for Egyptians.